Hello! Some time ago I had started (and promptly abandoned) a project in solarus using tiles from the Zelda Game Boy Color games, and since I don't plan on continuing said project, I figured making the tileset I used public is better than letting it collect metaphorical dust. It's a little crammed because I don't like having much empty space, so I'm sorry if it looks a little messy. 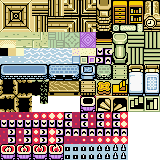 It's mainly Oracle of Seasons tiles because I originally wanted to have the option to change seasons (even if I didn't need that for my game); there's still a few (recolored) Link's Awakening and Oracle of Ages tiles in it, like a few dungeon entrances. Originally I made three palette versions (normal overworld, inside lost woods, and the graveyard) but I recently rearranged some of the tiles in the basic overworld one so the other two aren't up to date, and I'm not sure if there's still some rearrangement or tiles I need to do, so I'll leave them at that for a while. The original plan was to actually try and make a Game Boy Color Zelda resource pack but... as of now I only have two tilesets (Overworld-Spring and Inside Houses), about three different item files that I need to clean up, not properly cut music, I don't even have a single npc sprite because I was using ocs... Sooo I kinda gave up on that and that brings us to just the tileset. Yay.